In the previous two articles I addressed why you should consider implementing a dashboard and how to build one and what to include. This article addresses how to approach the creation and adoption of the dashboard. It’s important to understand that you are instituting a cultural change as well as technological and operational change, and that there are fears and concerns that need to be addressed. Creating and implementing a dashboard isn’t simply about choosing the right platform and inputting information. There is a human adoption element that is critical to the overall success of the program. As part of the planning process you need to determine who the key individuals are, both in the creation as well as the usage of the dashboard. If your role is the Executive Director, you may already know who you think should be involved, but first ask yourself some key questions to orient yourself. “What’s your destination? What are you expecting to get from implementing this? How will things be different after the implementation? If you don’t know what will change and why, it will be difficult to determine who all will be affected by that change, and who should be a partner in this process. Once you identify the key individuals, bring those people together and ask them the same orienting questions. 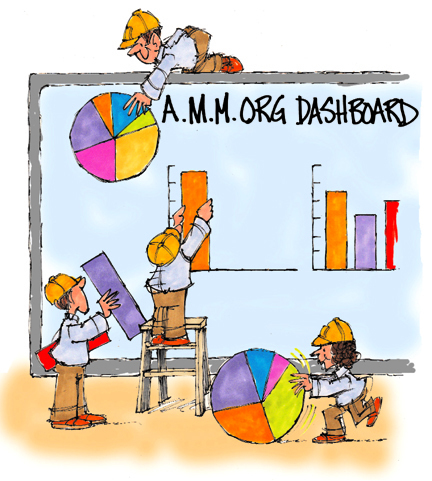 Getting key people into the room to develop the dashboard serves two purposes: Buy-in and Right Metrics. The individuals who are going to be providing the key information and also acting on the insights are the people you need to involve in the creation of the dashboard. Not only do they have deep insights and on the ground perspective, but they also hold the success of the program in their hands. They know the critical levers that need to be monitored. While the Executive Director serves to maintain focus and keep the dashboard from becoming overwhelmed with too much information, it’s important to hear what and why different information should be included as well as the actions to be taken at each juncture. The process of talking through these decisions enables the staff to be heard and see that their knowledge and opinions matter. One reason that Directors find so much resistance to change from their staff is from fear. Staff members who are not informed and involved in the process often fear that the dashboard is simply a guise for eliminating people in the name of efficiency and productivity. I’ve seen Directors go behind closed doors and generate the most elaborate and well thought-out processes and bring them back to their staff only to meet major resistance. Why? Because they didn’t involve them up front and that fear from being left out created opposition. If you’re simply looking to “trim the fat” and identify people to cut, or want to use the dashboard to provide data to hold over your staff’s heads, then you’re undertaking the dashboard for the wrong reasons. But if you are truly are interested in understanding how your organization operates and how it can function better, then your staff will need believe it too and be more open to the change. While it’s tempting to try to short cut the process and either create it yourself with an outside consultant or develop it with an elite internal group, you won’t save time and instead will extend the process. It is unwise to simply send it to everyone after you’ve created it and try and convince them of it’s worth once finished and ready to launch. It may take longer to develop the dashboard in terms of the number of rounds and discussions, but the overall timing to launch will be minimized because you have the team agree to the decisions along the way. A Dashboard can be an effective tool to increase productivity, enable better discussions with the Board and utilize their expertise more efficiently and even serve as a unifying opportunity by enabling conversations within the organization and recognizing the value of team members. If done correctly, consistently and well, a dashboard can help a non-profit grow and thrive to meet the intended mission. Ultimately, that is what everyone wants.